Anderson County Emergency Medical Services is a KBEMS certified ground transport Advanced Life Support provider serving all of Anderson County, including the City of Lawrenceburg, Kentucky. Anderson County EMS holds the only certificate of need for all emergent and non-emergent transportation for Anderson County. 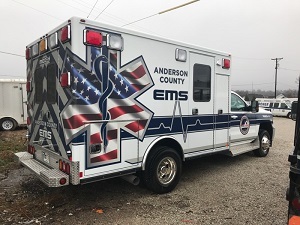 Anderson County EMS covers 204 square miles with a population of approximately 21,000 with three Advanced Life Support ambulances and three command support vehicles 24 hours a day, 7 days a week. Call volume for 2010-2011 reached 3700, for 2011-2012 it reached 4,142 and in the last current year for 2016-2017 we responded to 4,500 calls. Anderson County EMS uses state of the art technology including Zoll E and X Series monitors/defibrillators with 12-lead, pacing, NIBP, SP02, and ETC02. Anderson County EMS also uses Ferno Stretchers, Macs C-Pap system, Med 2000 syringe pumps, EZ-IO Parapac transport ventilators, Lucas 2 device, Kenwood Nex-Edge Radio systems and an expanded inventory of all Advanced Life Support medications. EMS eSchedule - "A customizable web-based scheduling application that can help with scheduling as well as many other tasks that EMS administrators are faced with." iPCR - "Electronic Patient Care Reporting for Fire and Ambulance Services that meets state specific requirements in addition to being fully NEMSIS Gold Certified." Active911 - "A digital messaging system that delivers alarms, maps and other critical information instantly to first responders. Active911 also allows response efforts to be monitored in real time." eDispatches - "A simple way for you to record your own messages that will be delivered to your own members' as an ordinary phone call and/or text message." IN CASE OF EMERGENCY DIAL 911!! 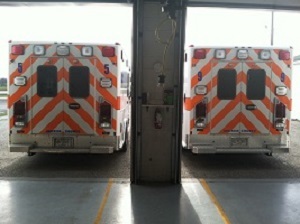 ​Anderson County EMS is currently accepting applications for Full and Part time paramedics, as well as Part time Emts. For more information please contact the station at (502) 839-7378 or (502) 839-7642 M-F 8am to 4pm and ask to speak with the shift commander on duty.